How, when and why to use Air Cell Cushions? 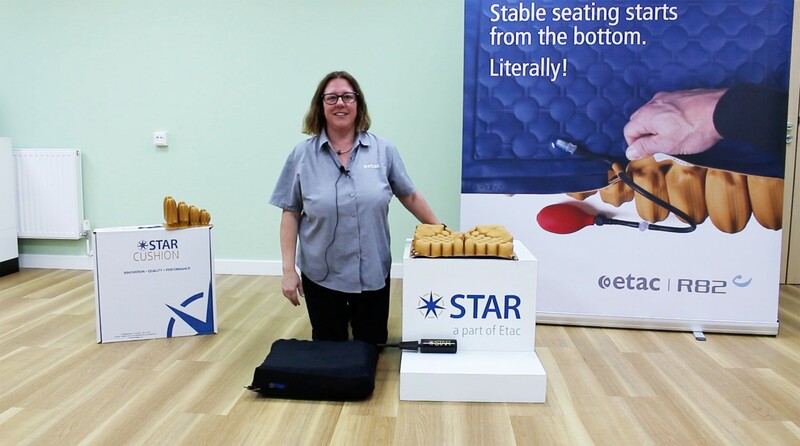 Etac R82, the UK’s leading supplier of Scandinavian-inspired assistive equipment for disabled children and adults, is extending its educational programme to include the Star Air Cell Cushions. TRAINING DATES: 27 Nov 2018, 18 Dec 2018 and 24 Jan 2019. 9:30-12:30. This free half day training course is aimed at clinicians working in the field of posture and mobility who want to further their understanding of Air Cell Cushions and pressure care. The course will be led by Jo McConnell, OT and Clinical Manager who will provide Star cushions from the Etac range for practical demonstrations. Course materials will be provided to support CPD learning whilst each attendee will receive a certificate of attendance. To assist with future work in practice, professionals will be given a free Etac MultiGlide glove for easier postural and seating assessments. Availability is limited for each course so early booking is advised. Jo is a highly experienced OT with over 25 year’s of clinical practice. During this time she has worked in paediatrics, posture and mobility within Wheelchair Services, Whizz Kidz Charity and mobility equipment manufacturers. She has outstanding knowledge regarding complex posture and mobility issues and pressure care.